Conor McGregor on Conan O’Brien ahead of the Irishman’s showdown with Floyd Mayweather on August 16th at the T-Mobile Arena in Las Vegas. The fight is now a little over a week away with all the hard training now done by both combatants at this stage. Yesterday the Nevada State Athletic Commission ruled that the fighters could wear eight ounce gloves as opposed to the usual ten ounce. Straight away after that, the odds makers gave McGregor even more of a chance off the back of the decision – with the perception of some that he now somehow stands a better chance of knocking Mayweather out. Surely McGregor’s only chance is a punchers one of course, but the ruling could also be viewed as a big plus for the professional boxer of the two, Floyd Mayweather. Mayweather obviously feels like he can stop McGregor inside the distance after insisting on the smaller glove weight and many within the boxing world feel like his chances of that have now been aided following yesterday’s decision. 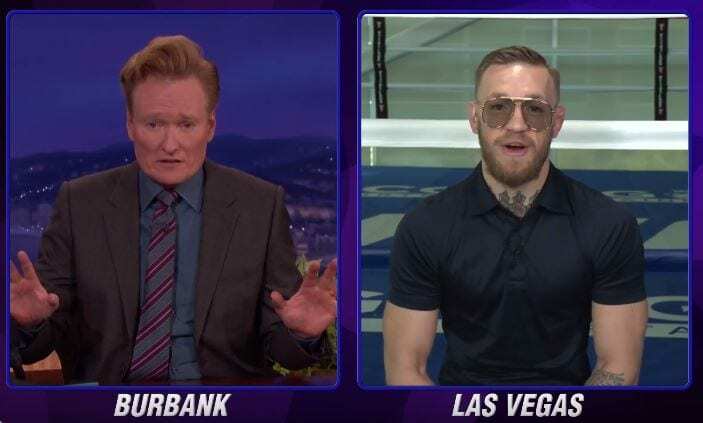 Speaking ahead of the August 26th showdown Irishman Conor McGregor appeared on Conan O’Brien’s popular TV show and as always, he didn’t mince his words.